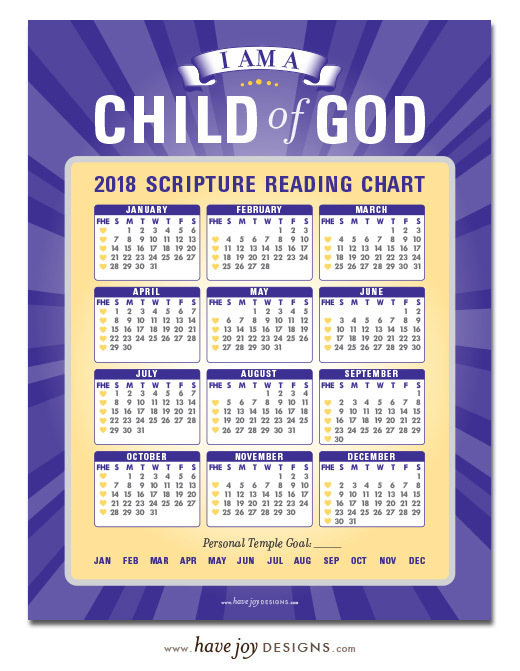 You can find our 2019 Scripture Chart here. 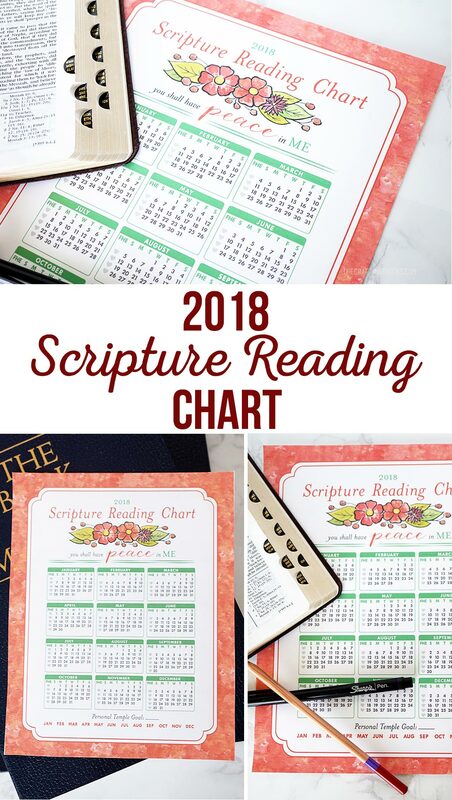 We are back with our 2018 Scripture Reading Chart, designed by Have Joy Designs. This year we have the chart in 3 sizes – 16×20″ you can use as a family. Ours hangs in the hall by our children’s room and we use smiley face stickers to mark the days we have read. There’s also a smaller 8.5×11″ size and an even smaller size, that will fit in the front of scriptures. Our stake has challenged us to up our personal scripture study and I plan on keeping this in the front of my scriptures to keep me on track. On the left side of every month is a heart you can mark off when you have Family Home Evening, and at the bottom of the chart are the month you can use to help keep track of temple attendance. 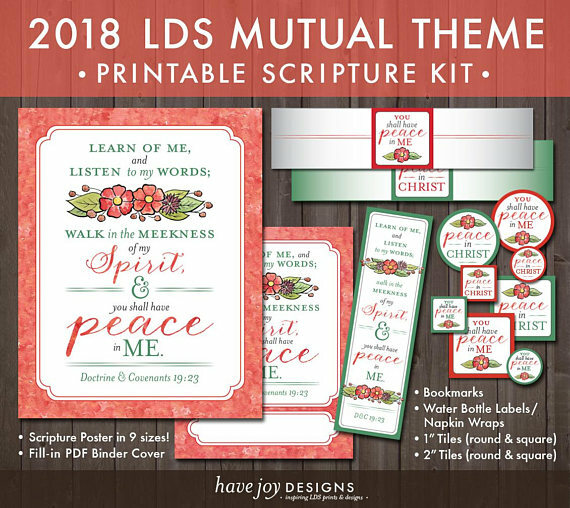 Have Joy Designs has a coordinating 2018 LDS Mutual Themed printable bundle available in her shop. 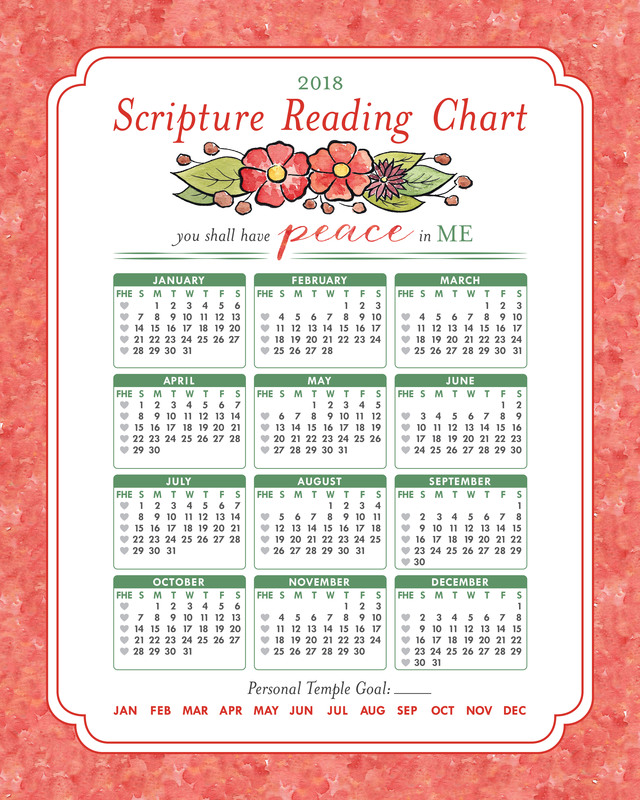 There is also a free scripture reading chart themed for the primary available on her site. 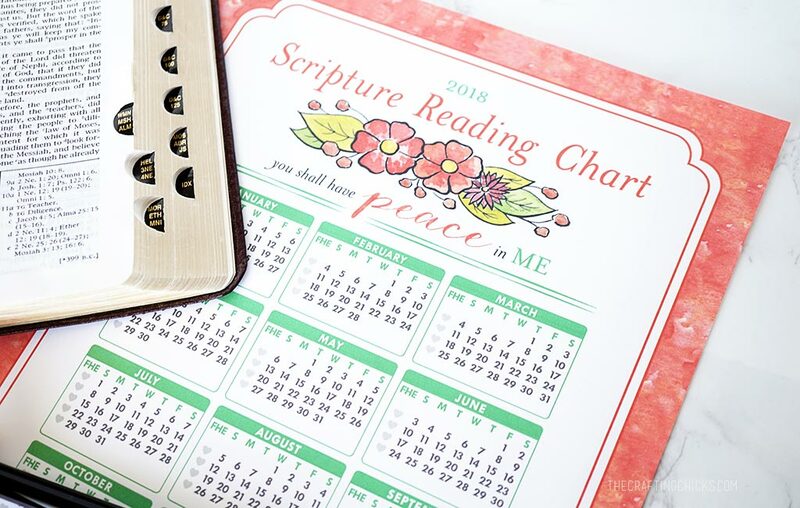 Thank you for creating such a beautiful way to keep track of scripture study. I’m one who struggles with this, so a visual is truly appreciated! 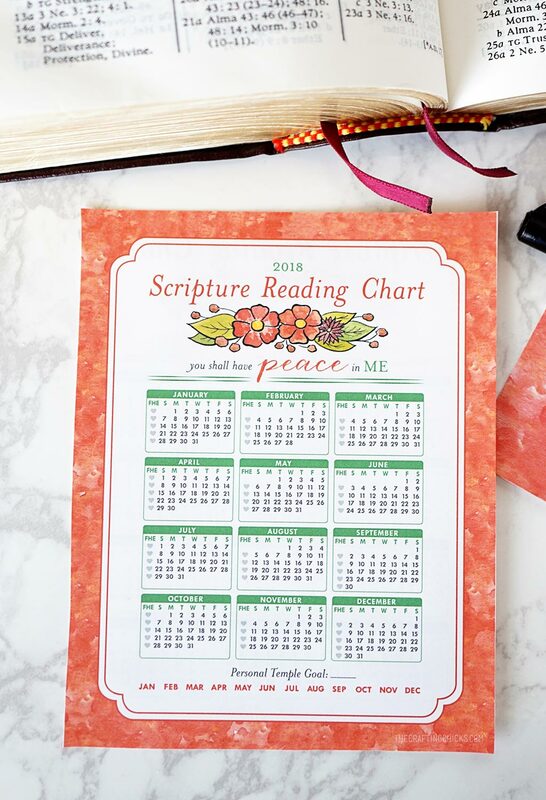 Just wanted to say ‘thank you’ for creating and sharing these scripture reading charts. Yours are my favorite because they include reading, temple attendance and FHE. These are lovely. Thank you! Thank you so much Tamara. We love those additions to our chart as well. 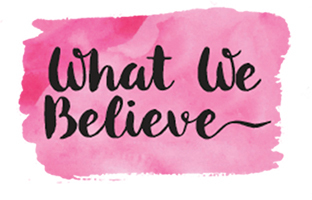 They are a great reminder. 🙂 Have a great New Year. Hello. I’d love to use the 16×20 chart with my family. Is that still available to download? I’m having some trouble with the link. I’m late to the game, but wanted to get the 16×20 printed out. It gives me an error message when I try to download. Can you help? Thanks so much!! I come here each year looking for your scripture chart! Thank you SO MUCH for your efforts to help families out. I am also trying to download the 16X20 and having issues. Can you let me know when they are resolved? I am excited to get tracking with the kids 🙂 You are so great! Thanks again for all you are doing!!!! I’m so sorry about that. We have the issue resolved now. Enjoy! 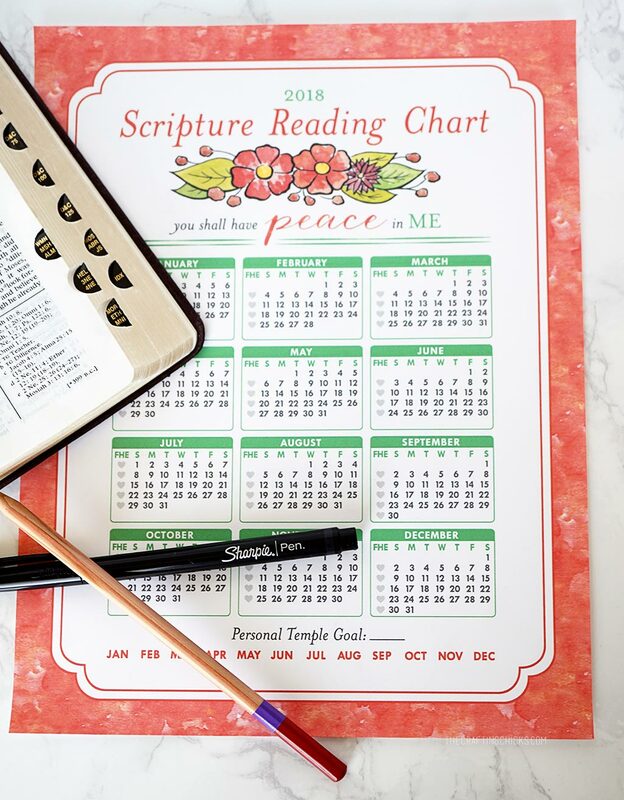 I’ve been using your Scripture Tracking Charts for a few years now, they are just perfect. Thank you! I wondered if you’d be putting out a 2019 calendar? I love using this chart for our family! Thank you for your willingness to make it for us ❤️❤️ I came here hoping there will be one for next year? Here I am again in search of the next tracking chart 😝 You life’s are the greatest for helping families like this. Please let me know when/if the next one will be available ❤️❤️❤️ Thank you!! !